Hawaii Democrat Mark Takai was sworn in as the representative of Hawaii’s 1st Congressional District by House Speaker John Boehner. Takai was accompanied by his wife, Sami; son, Matthew; and daughter, Kaila. WASHINGTON — The 114th Congress that convened Tuesday has 14 Asian Pacific American members, a net increase of one over the previous Congress. All but one of the 14 are in the House. The new members are Ted Lieu (D-Los Angeles), succeeding Democrat Henry Waxman, who retired after 40 years; Mark Takai (D-Hawaii), succeeding Democrat Colleen Hanabusa, who gave up her House seat to run for Senate; and Aumua Amata (R-American Samoa), the first female to represent the U.S. territory, who defeated longtime incumbent Eni Faleomavaega, a Democrat. 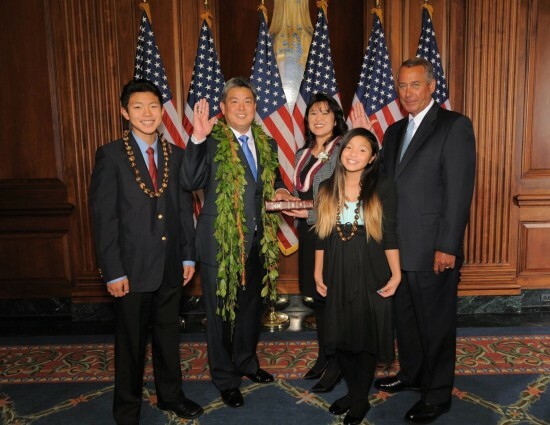 APA House members who were re-elected in November are Mark Takano (D-Riverside), Judy Chu (D-Pasadena), Mike Honda (D-San Jose), Doris Matsui (D-Sacramento), Ami Bera (D-Sacramento), Tulsi Gabbard (D-Hawaii), Tammy Duckworth (D-Ill.), Grace Meng (D-N.Y.), and Bobby Scott (D-Va.), who is also a member of the Congressional Black Caucus. Gregorio Kilili Camacho Sablan, the Northern Marianas’ delegate in Congress, caucuses with the Democrats but ran as an independent. Democrat Mazie Hirono of Hawaii is the only Asian Pacific American in the Senate. Elected in 2012, she is the first Japan-born immigrant, first Asian American female and first Buddhist in the Senate, and Hawaii’s first woman senator. The Congressional Asian Pacific American Caucus, chaired by Chu, had 41 members in the last Congress, as non-APA legislators who represent APA constituents can also join. The new Congress counts more minorities and women than ever, although lawmakers remain overwhelmingly white and male in the Republican-controlled House and Senate. A record 104 women, and for the first time, African American members of both genders and representing both parties, are now serving in Congress. The number of female lawmakers is up slightly from 100 at the close of the last Congress, but represents about only 20 percent of the total. A total of 96 racial minorities will serve in Congress, about 18 percent. A total of 84 women will serve in the House, compared with 80 in the last Congress. The new lawmakers include Elise Stefanik, 30, a New York Republican who is the youngest woman ever elected to the House. Also making history is Mia Love, 38, whose election to a suburban Salt Lake City district made her the first black female Republican to win a seat in Congress. A total of 44 African Americans will serve in the House, including another Republican freshman, Will Hurd of Texas. There are 34 Hispanic lawmakers, including 10 Republicans, and two Native Americans, both Oklahoma Republicans. The number of women in the Senate remains at 20, following the election of Republicans Joni Ernst of Iowa and Shelley Moore Capito of West Virginia, and the defeats of Democrats Kay Hagan of North Carolina and Mary Landrieu of Louisiana. Re-elected were Republican Susan Collins of Maine and Democrat Jeanne Shaheen of New Hampshire. Two African Americans serve as senators: Republican Tim Scott of South Carolina and Democrat Cory Booker of New Jersey. There are three Hispanic senators: Republicans Marco Rubio of Florida and Ted Cruz of Texas and Democrat Robert Menendez of New Jersey.